Skowron went to Purdue on a football scholarship, but baseball became his career when, in his sophomore year, he batted .500 for a Big Ten record that held up for a decade. He signed with the New York Yankees in 1950, but didn’t arrive in the majors until 1954. For the next seven seasons, the Yankees won seven league pennants and four World Series championships. 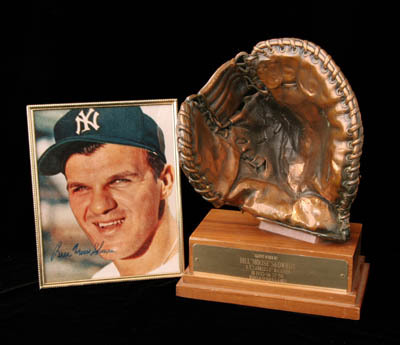 In 1963, Skowron was traded to the Los Angeles Dodgers and played for a fifth World Series champ when LA swept the series from the Yankees. In 14 seasons (1954-1967), “Moose” Skowron compiled a .282 batting average, hit 211 home runs and batted in 888 runs in 1,658 games. 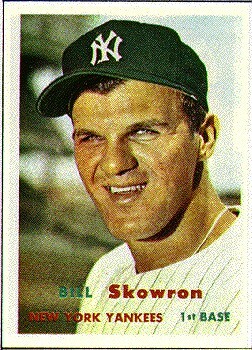 William (Moose) Skowron was born in Chicago, Illinois, on December 18, 1930. His early high school athletic success attracted interest from Purdue University and Skowron was offered a football scholarship. Bill also played baseball and basketball at Purdue. In his sophomore year, Skowron batted an amazing .500 average for a Big Ten record that stood for a decade. The New York Yankees came to campus and signed Skowron in 1950. The muscular six-footer embarked on a winning major league career. He broke in with Norfolk in 1951 and that year they won the pennant. In 1952 and 1953, Skowron helped Kansa City win American Association championships. From there, “Moose” went to the parent club, the New York Yankees. He played for the Yankees from 1954-1962. During these years, the Bronx Bombers won seven pennants, appeared in seven World Series, and won four World Championships. In 1963, Skowron joined the Los Angeles Dodgers and played for a World Series’ Champion for the fifth time in his career as L.A. swept the series from his former New York team. Skowron enjoyed baseball. It was his life and he would talk about the game with the rookies all the time. They enjoyed his baseball banter as well as his advice in the clubhouse, hotel lobbies and coffee shops late at night. In his fourteen season career, Skowron hit over 200 home runs and hit for a .282 average. In his five World Series’ appearances, “Moose” hit .293. Bill Skowron’s career had many thrills. 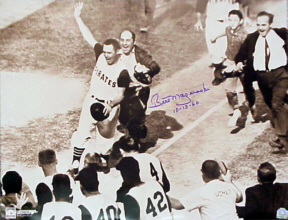 The 1958 World Series provided “Moose” with his career highlight in the seventh and deciding game at Milwaukee. “It was a three-run homer off Lew Burdette. The one which clinched the championship for the Yankees,” recalled Skowron. “I made the final out of the ’57 World Series against the Braves. Even though it was a sizzling shot at Eddie Mathews, it was the last out. “That ’58 homer got us even, especially by coming back to win the series from a 3-1 game deficit,” added Skowron.